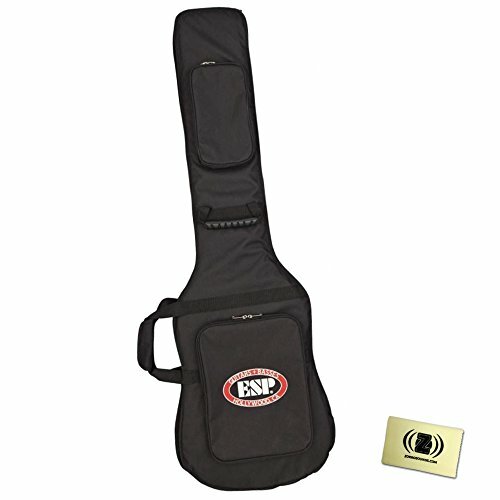 ESP LTD CGIGDXB Deluxe Bass Gig Bag with Custom Polishing Cloth Keep your electric bass safe with the ESP Deluxe Bass Gig Bag. Made from durable nylon with a plush lining, the ESP Deluxe Bass Gig Bag protects your axe from dings, scratches, and dirt common with transport and even storage. Two large external pockets let you store a strap, tuner, strings, picks, and even sheet music. Protect your ESP or LTD bass with the ESP Deluxe Bass Gig Bag. Features Two large external pockets Made from durable nylon with plush lining custom designed polishing cloth Keep dirt, grime and fingerprints off your equipment with Zorro Sounds' custom designed polishing cloth. Plush and non-abrasive, this cloth will safely remove any impurity, so your instrument will shine as brightly as your rock star self.